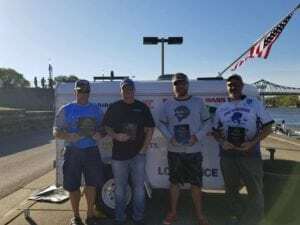 Pre-fishing in wind and rain, then evening T-storms and tornado watches gave way to a 41 degree cold front to greet Minnesota and Wisconsin’s best bass anglers on day one. After a short fog delay 108 anglers left Winona’s Levee Park to pursue the green and brown bass that call the Mighty Mississippi home. WI Co-Angler Champion Deven Etnyre used his river fishing experience from pool 13 out of Illinois, where he is from, to power fish and cover water with swim jigs and pitching to wood. WI Boater Champion Brady Ferrell had his day one grass flat muddy up on day 2. The earlier days rains had finally made it down to his spot. Randy was prepared though, as he had back up spots to go. He used full practice days to locate many fish. 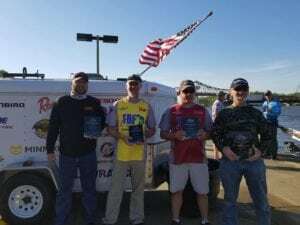 His Brovarney jigs and backup plan on day two sealed his second trip to TBF Nationals, plus $500 Ranger Cup money for this event. 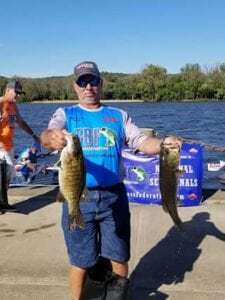 MN Co-Angler Champion Richard Conrad decided to fish exclusively for smallmouth, he felt with rising and muddy water coming along with the severe cold front bronze backs would put on the feed bags and a sack of largemouth would not be competitive at the scales. Both Devon and Richard said their boaters were great and a big part of producing the quality bags. 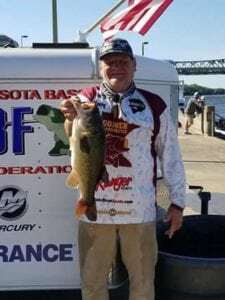 The 2018 District 9 overall Champion Minnesotan Randy Wieczorek had a good day on day one, but knew he had to step it up on day 2, with the river getting more muddy as the hours went by on day one, he decided to change things up on day two. With the back waters remaining clear, he frog fished and brought in a huge 16.33 sack to seal the win. Marty Terveer was delayed by a barge at the dam, so he pitched the nearby shoreline as he waited, to it’s surprise a 5.71 largemouth took a ride back to weigh in as the events’ largest fish. We are all looking forward to next year’s shoot out in Lacrosse, WI.